Here is my latest mini letter, it's so much fun creating these but only if the postal service is on your side as I posted this out in the first week I February I think and it hasn't reached its destination yet but I'm keeping positive that it will. Got that Swing mentioned that she liked books and mushrooms. I've always wanted to use old book pages to doodle or get creative with so when a friend sent me some book pages I jumped at the chance to do something with them, for her I created this. 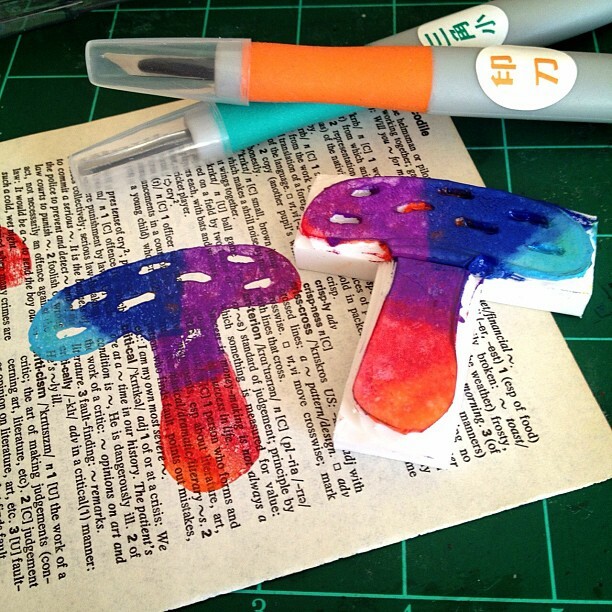 I didn't have anything mushroom related so at first began to doodle a pattern but then I suddenly thought about the great tools that I had purchased at the end of last year and decided to make my own rubber stamp... it was so easy and a lot of fun but I really need to think about getting a slab of rubber in order to create things properly. It turned out great don't you think? It wasn't so hard to stamp with the pieces but it would of course have been better to have one piece so that it all stays together. I stamped using a mixed colour wheel that I bought but I've had quite a battle with it as the ink doesn't dry quickly on any paper that I use it on so is prone to smear but also this paper didn't have an obvious layer on it that caused other inks to blur a little and smudge also. 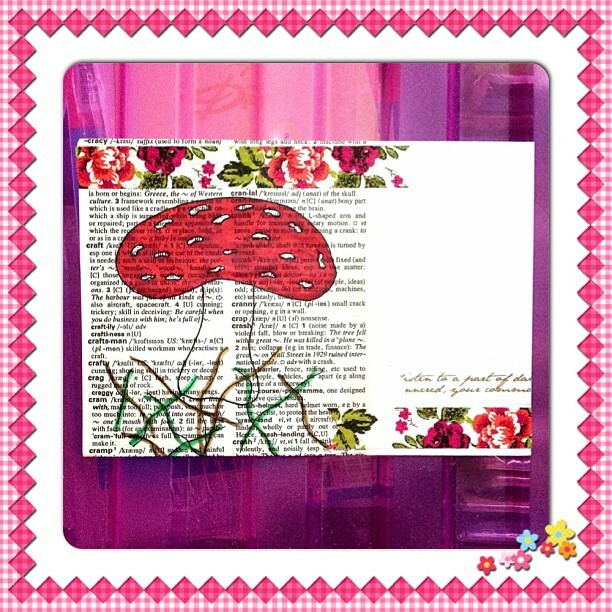 Since I used a dictionary page I decided to look up and use the definition of a mushroom to fit in nicely with it all. I think this postcard looked so much nicer then the photo though. along with washi tape to bring both the postcard and envelope together. Of course I didn't just stop there I had to get a sheet of paper to write on with a book theme also! Got that swing always sends me delcious chocolates and fudge making sure I can eat it before she does which is so nice of her. 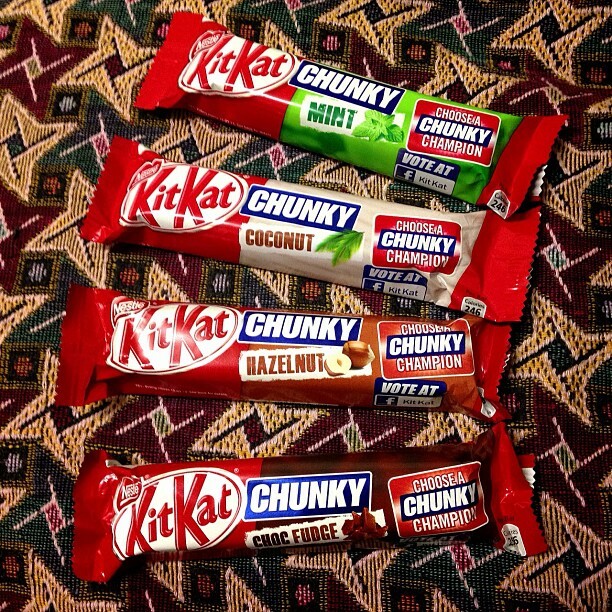 So I decided to include some kitkats, which is no surprise to her as I was quite over excited at the thought of some new flavours and was quite vocal about it. Maybe the postal service opened the box I sent them in and decided to eat them, themselves... I wouldn't put it past anyone as its chocolate after all. I only tried the cookies and creams but not any of the others. I'll wait until my Easter holidays to see if this turns up and then I'll recreate something else, its such a shame when these things happen! That was such a creative postcard! 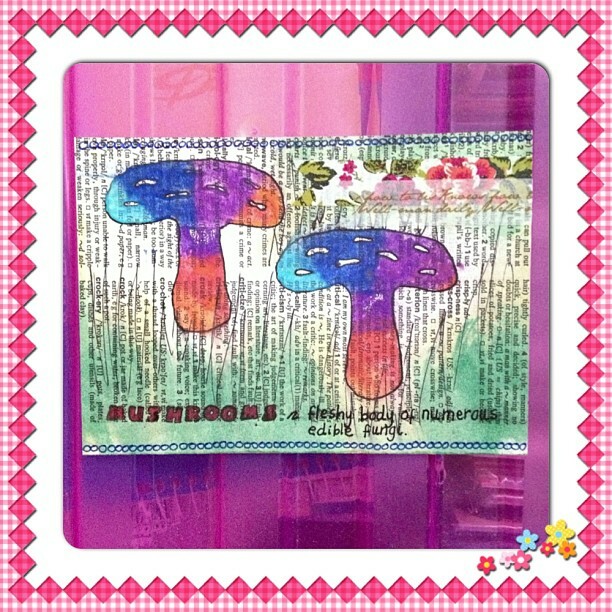 I like that colorful mushroom. Did I understand right- your package with chocolate got lost? Thats such a shame! I hate when that happens. 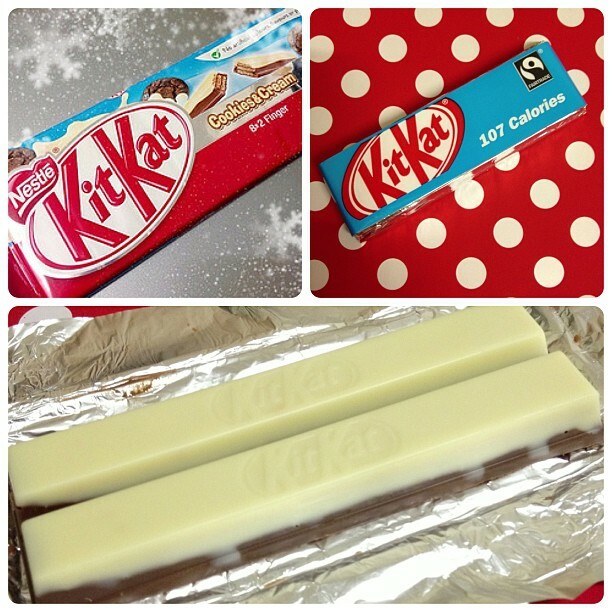 I have never tried different flavor of Kit-Kats. We don`t have them here, but those really look delicious. Thank you :), I think it has maybe got lost but who knows as I've thought that and some months later it has turned up. I'm hoping it will do this time :).